Tunnel Dryers are ideal for drying of Granulated / Extruded / Briquettes / Flakes / Fibrous / Pre Formed materials. Few of the applications are Ceramic Fiber Papers, Ceramic Fiber Boards, Molded Paper Products, Rayon Staple, Cotton linters, Noodles, Food products etc. 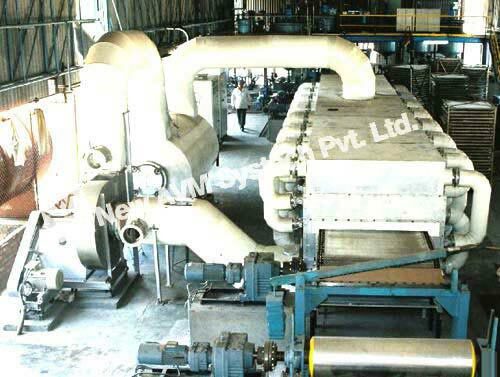 AVM offers Customized Tunnel Drying Systems with variety of Configurations. Single Pass / Multi Pass. Single / Multi Temperature & Airflow Controlled Zones. Once through / Re-circulating air modules. Continuous on Metallic Mesh Belt Conveyor. Continuous on chain mounted Moving Trays / Pallets. Semi-Continuous on Carts / Trolleys. Batch on Trays / Trolleys / Pallets.